Mobile App Developer? Dare to Say 'NO' to Coding? You are here: Home > Tutorials > Apps & Software > Mobile App Developer? Dare to Say ‘NO’ to Coding? Mobile App Developer? Dare to Say ‘NO’ to Coding? In today’s arena, mobile apps have become the hottest topic of discussion among techies. The mobile app development has become easier these days as sipping a cup of coffee. There are plenty of PaaS, BaaS and SaaS on the market; over thousands of platforms are readily available to develop an app without coding even a single line. Whether it is database design, API module creation, app screen design, preview or deployment to app stores, all is possible by clicks and drag-and-drops features. The development tools are quite developer-friendly as using some administrative module of an eCommerce website. We can say that creating an app is not a development anymore; it is a configuration. Why Build Mobile App without Coding? Majority of developers across the globe still code to build an app. Now, it is up to them whether they want to fetch water from the tap or dig a well in spite of having water from the tap. The innovators of such platforms have coded enough in the interest of developers who give a lot of pain to their fingers to develop a simple thing. It is not improper to say that the innovators of such tool might have coded developers’ part of coding as well! A new service in the market not only eradicates the hassles of coding, but also of integrating, testing and deploying apps to different app stores. It has knocked the opportunities to enterprises to reduce the cost on resources, and get enterprise applications without any complex procedures. These tools have also opened the door for those who possess no programming skills, but surely have an idea of an app. Said that, if anyone has an idea of a mobile app, they can build an app. 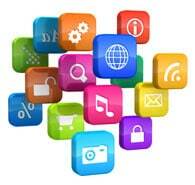 That is the beauty of these mobile application creating tools. If someone knows the flow of their app that how it should function, and then just drawing a flow diagram by dragging the tools, and the platforms automatically writes thousand lines of codes in the back. It sounds amazing but, this is the truth. Cross platform deployment across the devices available on the market come with user-friendly features and operations. The tools available have taken all the coding hassles to their part, and app developers have to make clicks only. As far as ‘designing’ a mobile app comes we may have to shortlist the available tools as they come with restricted functionality. To design a mobile app, one requires creativity in designing. Not all can do graphic designing on their own; and tools may not leverage with all designing tools as well. But yes, if we have a graphic design of the app, even if in Photoshop, then tool like Configure.IT can convert it directly to app design. For this, one needs to import .psd file to app configuration screen. The information has been shared by Sandeep Mundra, the co-founder of Configure.IT. App developers see such tool as an opportunity, but with a little insecurity. However, it is actually more an opportunity than a threat. The developers can be assured that such tool won’t eat up their jobs! In fact, they can develop more in less time without compromising on standards provided by various platforms, without any extra efforts. They can build a database, connect API –all with clicks only. They can integrate big data with mobile applications by clicks only. So, it’s a great opportunity to them. As far as enterprises may develop apps on their own, still looks a far reach goal. As, using these tools don’t require any programming skill but requires IT knowledge. Entrepreneurs can’t develop apps without having basic IT knowledge. They can’t develop enterprise apps with their management skills only. So here, they still require developers. Though an experienced developer or a beginner won’t matter here as far as an app development is concerned. So, all you developers, don’t dig up the well to get water, there we have a ready made tap! It is smart work over hard work. Adapt to the latest technologies and be a part of the change. This article is written by Binay Kumar. He is a digital marketing manager at IndiaNIC Infotech Limited, a web and mobile app development company. Meet him on Facebook. Magento Mobile – Does it Serve as the Right Option for your Business? Nice blog. Yes the Cross platform deployment help the developer is really user friendly feature. It helps developer to simplify his job. Hi, Souvik. Your biography says that you’re a SEO specialist. If your company has a mobile app, does it help your rankings on Google? I really like the concept of mobile apps.